Streamline your resource usage with Windows 7 Tweaks - Windows 7 has been optimized quite efficiently by Microsoft developers, in order to ensure maximum utilization of available system resources at any given point of time. However, applying a few Windows 7 Tweaks will make Windows 7 run even better and allow you to access important system tools and utilities faster. Here are some top of the line tweaks available for Windows 7. 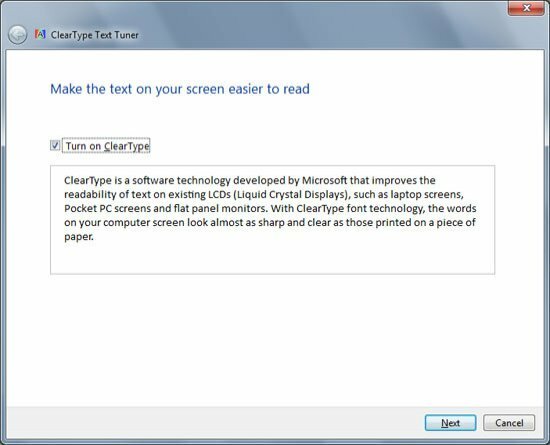 If you install Windows 7 in a laptop, make sure to tune ClearType text display options to make text easily readable. Display color can also be calibrated from the same system control. The wizard available makes the process hassle free and quick. Simply click on Start Menu and in the search box type "cttune". The search result will contain links to the wizard. Activate the wizard by simply double clicking on the corresponding links and follow the on-screen instructions. In order to calibrate the display color, click on Start menu and type "dccw". Now follow the same steps as above. User Access Control (UAC) was a dreaded feature of Windows Vista, and one that was usually the first feature that users disabled after installing the operating system. 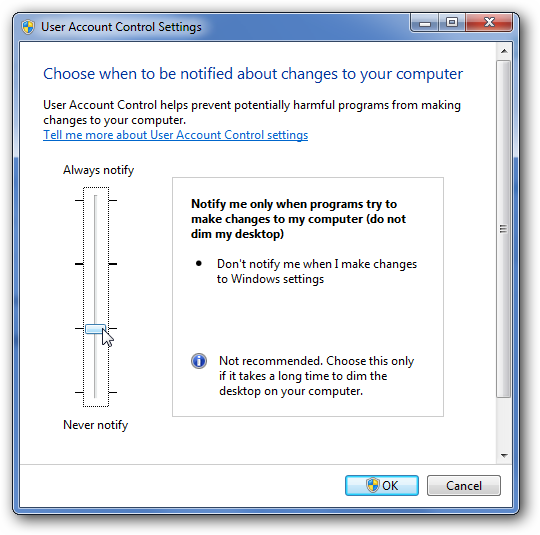 In Windows 7, the warning pop ups of UAC can be greatly reduced in number. Simply click on Start menu and type in "uac". When the result appears, click on it to access UAC window. Move the slider to a comfortable level. The setting directly above the last one has the best balance between ensuring security and eliminating nagging pop ups. You no longer have to hunt for freeware disc burning software that may be infected with malware. Use the default CD/DVD burner to burn your own discs from ISO image files. Simply double click the image file and the application will start. It has minimal options, but it works. To add to that, it also consumes less system resources. These are just 3 of a couple hundreds of tweaks that can be applied to Windows 7. In fact, there are enough Windows 7 Tweaks around for you. Learn how to Make Your Windows 7 Auto Login - Learn how to set up your computer so that users do not have to type username and password to log on into Windows 7. 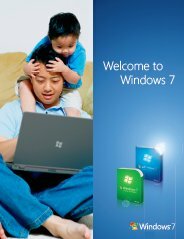 Learn how to Install Windows 7 from USB - This articles is very useful for Netbook users, because these Mini Netbooks comes without a CD/DVD-drive. Have A Great Windows 7 Tweak to share? Do you have a tweak windows 7? Share it! Your tweak will appear on a Web page exactly the way you enter it here. You can wrap a word in square brackets to make it appear bold. For example [my story] would show as my story on the Web page containing your tweak.